Often called the 'the best NCLEX® exam review book ever,' Saunders Comprehensive Review for the NCLEX-RN® Examination provides everything you need to prepare for the NCLEX exam - complete content review and over 5,100 NCLEX examination-style questions in the book and online. Don't make the mistake of assuming the quality of the questions is the same in all NCLEX exam review books, because only this book includes the kind of questions that consistently test the critical thinking skills necessary to pass today's NCLEX exam. Even better, all answers include detailed rationales to help you learn from your answer choices, as well as test-taking strategies with tips on how to best approach each question. 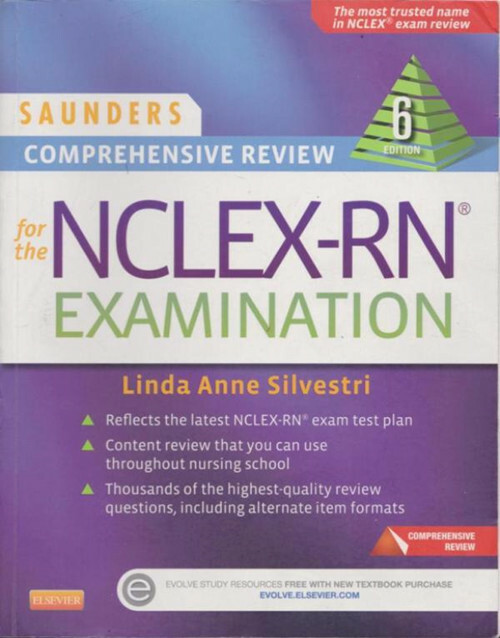 Written by the most trusted name in NCLEX review, Linda Anne Silvestri, and updated to reflect the most current NCLEX test plan, Comprehensive Review for the NCLEX-RN®Examination, 6th Edition is THE book of choice for NCLEX examination review. But don't just take our word for it - read any customer review or ask your classmates to see why there's nothing else like it! UNIQUE! A detailed test-taking strategy and rationale is included for each question, offering clues for analyzing and uncovering the correct answer option, and guiding you to remediation inSaunders Strategies for Test Success: Passing Nursing School and the NCLEX® Exam andSaunders Comprehensive Review for the NCLEX-RN® Exam.